Sri Lanka won the men’s Team Championship and secured the women’s Team Championship runner up position in the fifth Carrom World Championship worked off in Chun Wong, Korea recently. Lankan men’s team captained by Chamil Cooray beat strong India 3-2 while India clinched the women’s Team title beating Sri Lanka 3-0. Champion Sri Lanka men’s team included captain Chamil Cooray (Seylan Bank), Nishantha Fernando (SL Navy), Mohomed Shaheed Hilmi (Royal College - Colombo) and Udesh Chandima Perera (SL Air Force). 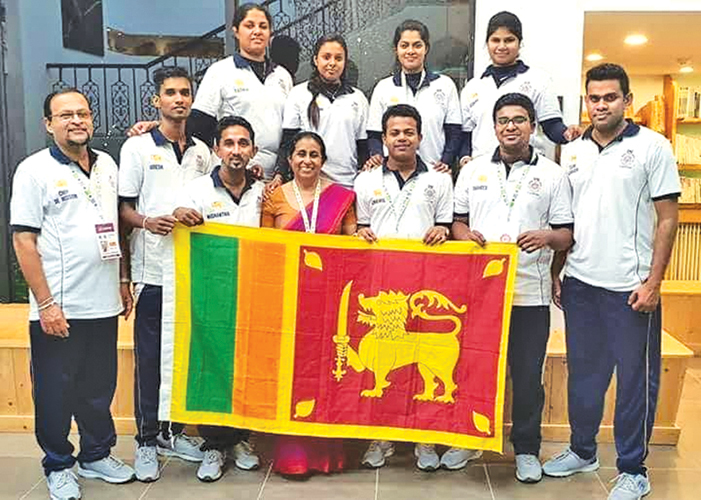 The runner up Lankan women’s team comprised captain Yashika Rahubadda (SL Air Force), Joseph Roshita (SL Navy), Chalani Lakmali Liyanage (SL Air Force) and Maduka Dilshani (SL Army). Korean Carrom Federation hosted the event under the supervision of World Carrom Federation where 20 countries including eight Asian and 12 European nations participated. India bagged both men’s and women’s Team titles in the previous time and Sri Lanka secured the runner-up positions. Sri Lanka was ranked number 1 in this year and it has been a good performance by the Lankans to retain the number 1 ranking.